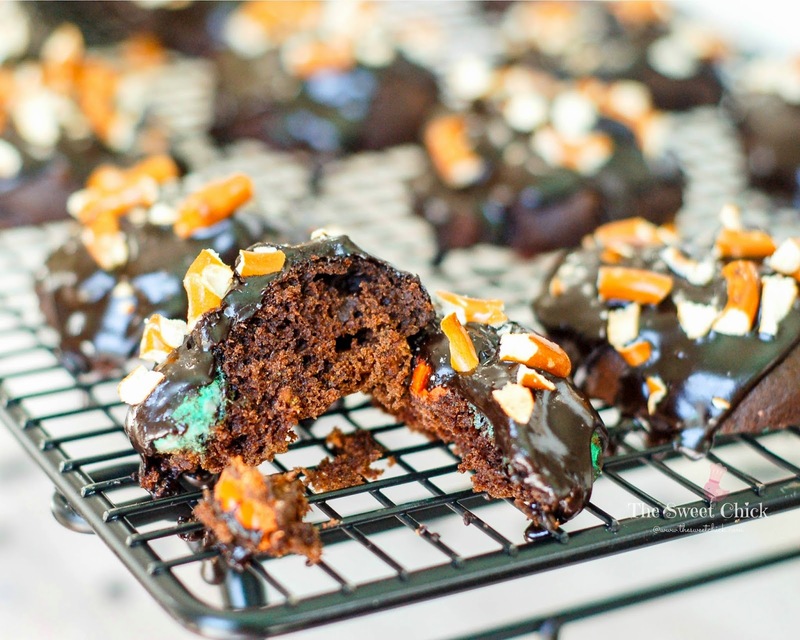 I love chocolate and pretzels together, so why not add a little pumpkin and pumpkin spice to liven things up a bit. 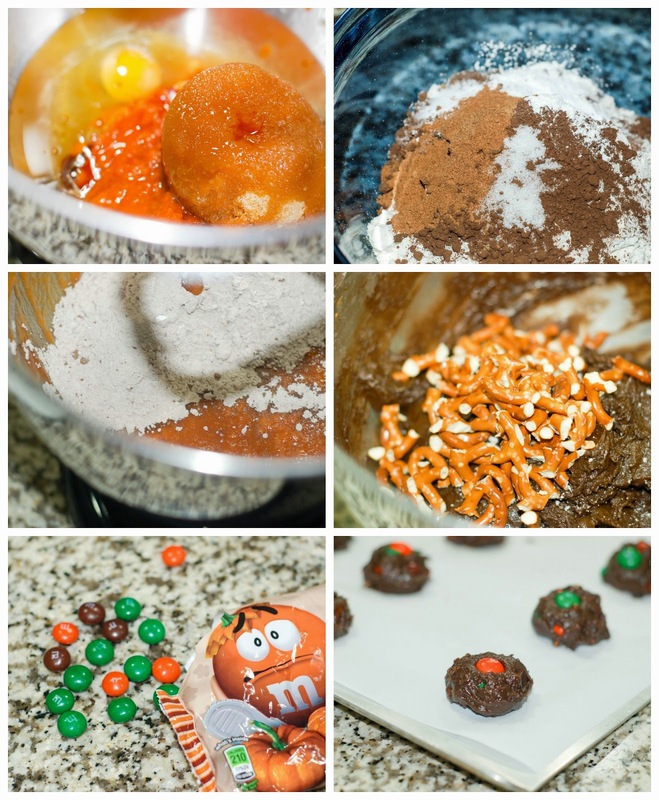 It's okay if you eat a few Pumpkin Spice M&Ms as you are mixing everything together. You deserve it. Once they are baked, you will probably think to yourself that these are just about the ugliest cookies you have ever seen. And you would be right. Unfortunately, Pumpkin Spice M&M's tend to bleed out their colors when baked. If you sit then on top, like I did for my Maple Pumpkin M&M Cookies, it's not so bad. Once mixed into the cookie, they kind make a mess. Have no fear, because we are going to pretty these up with a heavenly dark chocolate glaze. I kept the glaze on the thick side, more of a frosting to cover any M&Ms that lost color. I just poured it on with a spoon and spread it around a little. Since the pretzels inside the cookies became soft during baking, I wanted to add more to the top for some crunch factor. I also sprinkled the glaze with a bit of sea salt before adding the pretzel bits. 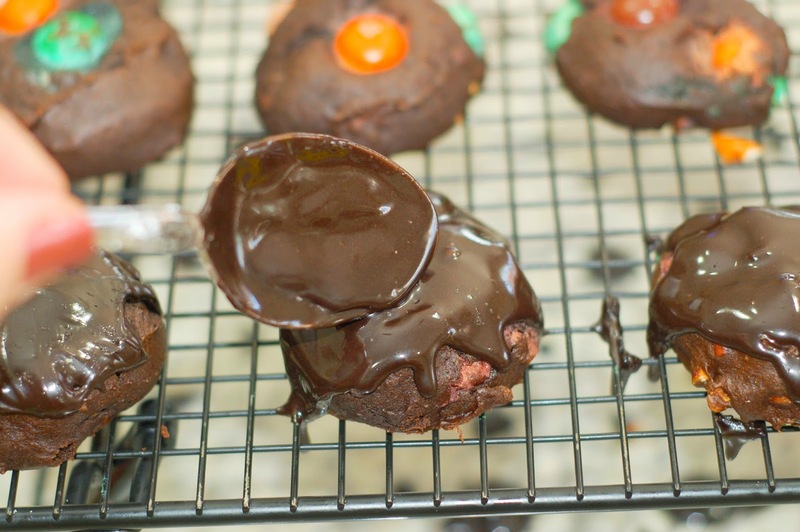 Not only did the dark chocolate glaze cover the ugly parts, but it added a new level of decadence to the whole cookie. The cookies themselves were a soft, cake-like consistency and full of pumpkin spice flavor. 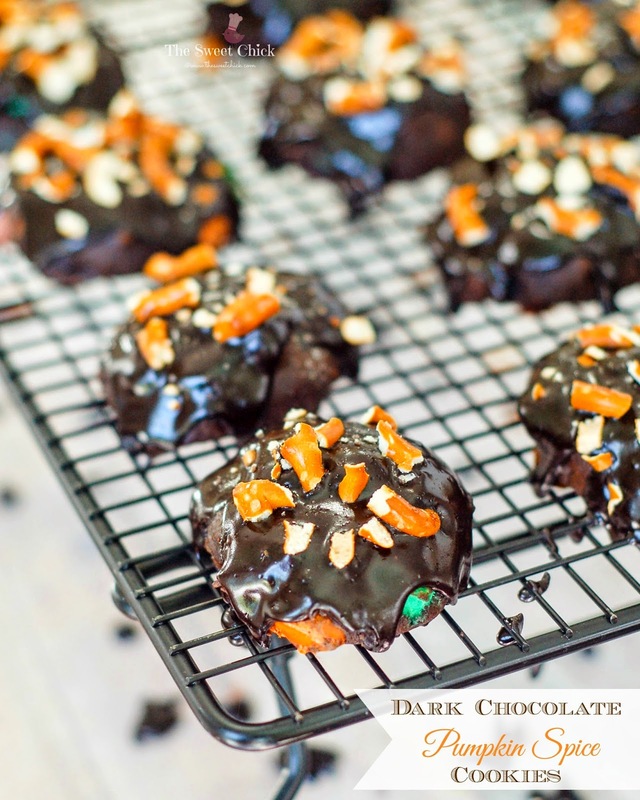 The thick dark chocolate glaze made them richer and enhanced the chocolate flavors while the pretzel bits on the top added a little saltiness and crunch. In a stand mixer, add pumpkin puree, sugar, oil, egg, and vanilla. Mix on low until well blended. 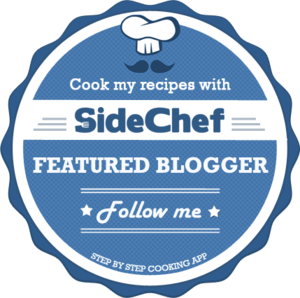 In a medium bowl mix together the flour, cocoa, baking powder, baking soda, spice, and salt. Slowly add the flour mixture to the pumpkin mixture while mixer is on low speed. Mix until smooth. Next add in the pretzel pieces, mixing until full incorporated. Then mix in the M&M's by hand. With a cookie scoop, place cookie dough mounds on a parchment lined or greased baking sheet, 2 inches apart. Let the cookies cool on the baking sheets for 2 minutes before moving them to a cooling rack with some wax paper underneath. Then let them cool completely before adding the glaze. 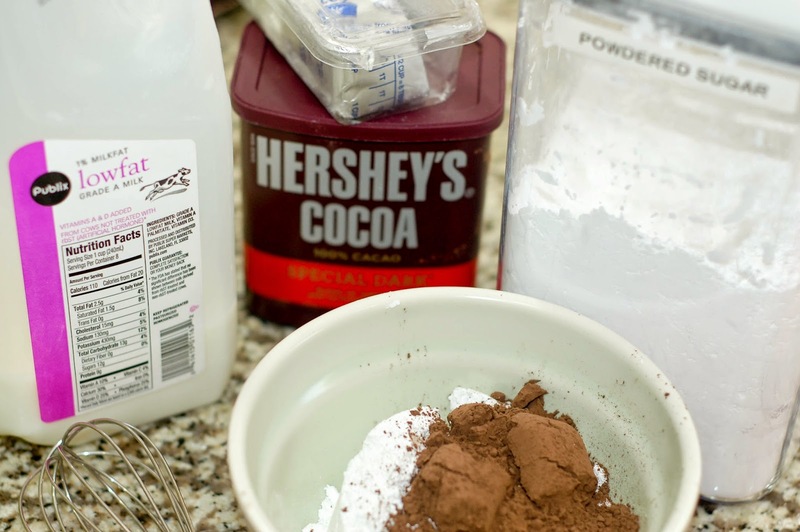 In a small bowl whisk together powdered sugar, cocoa, milk, and vegetable shortening until smooth. You want the glaze to be on the thick side. 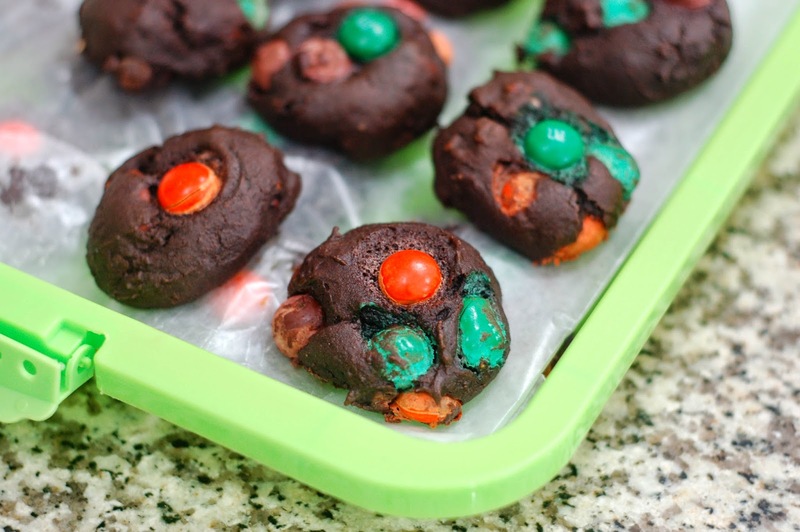 Using a spoon, pour a bit of the glaze over each cookie and spread it around a bit to cover any M&Ms that have lost their color. If you are adding sea salt and/or pretzel bits, add them before the glaze sets. (The glaze will not be completely hard, but will become thicker.) 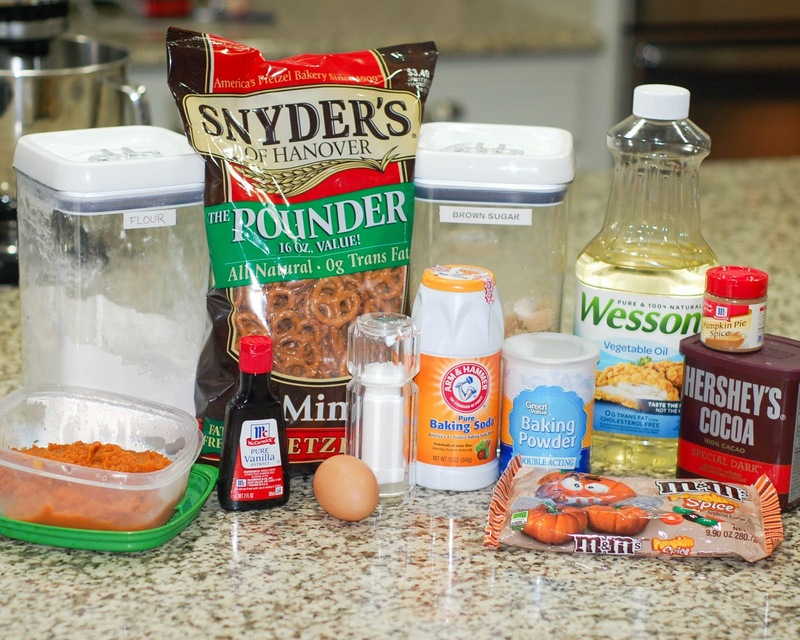 Just sprinkle a bit of sea salt on each cookie per preference and then sprinkle the pretzel bits.